An exciting race unfolded at the 2016 The North Face Lavaredo Ultra Trail with Switzerland’s Andrea Huser demonstrating her unwavering race strategy at this 119-kilometer distance with a deserved win in a time of 14:32:39. Great Britain’s Andy Symonds dominated the men’s race from start to finish, setting a new course record of 12:15:06 in the process. The scene was set in the mountain town of Cortina in the Italian Dolomites, and 119 kilometers of sweet trails and beautiful vistas was on the menu. The weather in the days ahead of the race had steadily risen in temperature from the low teens to a very warm 30 degrees Celsius. But fortunately just two hours before the start, the heavens opened and relieved the heat, making it a bit more bearable. As the runners amassed at the start line, pre-race nerves and anticipation were swapped for readiness for the 11 p.m. start time. The gun went off and the runners charged down the paved streets of Cortina with a large crowd cheering them all the way. It was sign of things to come as the pace never even settled; it was frenetic from the start and it didn’t cease. By the time they had reached Ospitale at 18k, race winner Symonds was in the top three and only two minutes off the course-record pace set by last year’s winner Didrik Hermansen, and it was only to get better as the race progressed. Scott Hawker and Pau Capell were also in the top six, a position they were to hold throughout the race. By the time the field reached Federavecchia at 33k, Symonds was a clear front leader and starting to make ground on the course record. Lithuanian Gediminas Grinius had slowly moved up and was in fourth and by Refugio Auronzo at 48k he was in second place just seconds ahead of Sylvain Court of France. Symonds’s lead was four minutes at this stage and incredibly he kept increasing this lead with a dominant display of running, dipping under course-record pace by a full 10 minutes from Cimabanche (67k) onward. Grinius worked hard in the latter stages to minimize the deficit, eventually finishing eight minutes behind the winner and also under the old course record. The surprise of the day was the performance of Spain’s Javi Dominguez; at 33k he was not even in the top 10, moving to seventh at Malga Ra Stua (75k). His progression to a third-place podium spot was phenomenal as he was five minutes behind Hawker and Capell at Malga Ra Stua and when they had reached Passo Giau (102k) he had taken third spot, passing Hawker, Capell, and Court. He remained solid from there to the finish line. The women’s race proved to be equally as exciting with a strong and consistent performance by Andrea Huser and close races in the top five. Rory Bosio took an early lead, passing first through Uberto at 16k with Federica Boifava just one minute behind and Andrea on their tails. Rory maintained the lead through Federavecchia at 33k, followed closely by Andrea with Federica, Uxue Fraile and Lisa Borzani coming in closely five minutes later. While starting strong, local favourite Francesca Canepa dropped out early on. Federica would also not finish. By the time the field reached Auronzo at 48k, Andrea, unfazed by the muddy conditions on the trail, had established a six-minute lead ahead of Lisa in second with Uxue following just a minute later. Rory arrived 25 minutes later in fourth, visibly struggling and nauseous. While Rory attempted to refuel and rest with her legs up on the wall, Fernanda Maciel, who had been running just outside of and then inside the top five for the race’s first third, was in and out of the checkpoint quickly, showing a level of energy and strength that would only continue throughout the race. The sun rose as runners descended toward Cimabanche at 67k, burning off the mist and wet weather from the night before. Andrea blew through the checkpoint having widened her lead, and Uxue and Lisa arrived 30 seconds apart 13 minutes later. Fernanda and Cristiana Follador breezed through in fourth and fifth place, 22 and 36 minutes off the lead respectively, with Marie McNaughton, then in eighth, starting to climb her way up the pack. At Col Gallina (95k), there was little doubt that Andrea would go on to win the race, arriving a full 30 minutes ahead of the next female runner. Attention then turned to the close competition between Fernanda and Uxue in second and third places, just one minute apart from each other. The sense of determination from both women was palpable as they quickly refueled with little words spoken. Cristiana arrived less than 20 minutes later with Marie on her heels, having jumped ahead of Sophie Grant and Yulia Baykova. Lisa, struggling with a previous leg injury, had dropped back to 14th place by 95k, eventually pulling out, along with Denise Zimmermann. Rory, displaying true grit, arrived alongside Mike Foote, who were both reduced to walking at that point and ended up finishing together. Lizzy Hawker, crewed by Nepalese runner Mira Rai, shared a laugh with her teammates before heading off at a strong pace in 12th place, eventually working her way up to a top-10 finish. Andrea finished the race in 14:32, a full 41 minutes ahead of Uxue in second. Fernanda, Cristiana, and Marie rounded out the top five, with smiles of relief at the finish line all around. Fernanda Maciel taking third. Photo: iRunFar/Stephanie Case. 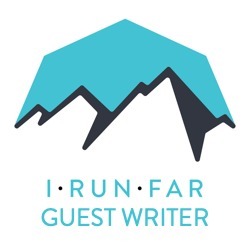 Thanks to iRunFar’s onsite coverage team, Ian Campbell and Stephanie Case, for their hard work. Thanks to Mauri Pagliacci and Dani Torres for their Lavaredo office work. Thanks also to Keith Byrne, Dave Yarwood, David Row, and Anders Ollgard for onsite transportation assistance during the race. It’s possibly the heaviest medal I have ever received so you have to brace your legs to stop them buckling under its weight!